Bobby Osborne was born to a schoolteacher/grocer in Depression-era eastern Kentucky. Like so many others from that region, the family migrated to industrial areas in the early 1940s, winding up in Dayton, Ohio. Robert Osborne, Sr. blended a job at NCR Corporation with part-time farming. In free moments, he enjoyed singing, yodeling, and playing guitar in the style of the Carter Family and Jimmie Rodgers. He taught rudimentary chords to his namesake and oldest son, who preferred the popular Grand Ole Opry artists of the day, particularly Ernest Tubb. All three children (Bobby, Louise, and Sonny) were musical. In 1947 they were bitten by the bluegrass bug after attending a sold-out Dayton performance by Bill Monroe’s classic band. Bobby got a thumb pick and a Martin guitar like Lester Flatt’s, but found that his emerging adult voice was as high, or higher, than Bill Monroe’s. Still underage, he began performing with like-minded neighbors at a bar. In 1949, a small-time talent scout took him to WPFB in Middletown, where Bobby’s first broadcast produced quite a local stir. Larry Richardson, a hot young banjo player from Galax, Virginia, came to Middletown, teaming with Bobby in several groups, culminating in several years with the Lonesome Pine Fiddlers. Larry and Bobby converted the group from a style similar to the Delmore Brothers to the increasingly popular (but as yet unnamed) bluegrass sound. Their song, “Pain in My Heart,” recorded for Cozy in 1950, was covered by Flatt & Scruggs later in the year during their final sessions for Mercury. Jimmy Martin, fresh from his first stint as guitarist/lead singer with Bill Monroe, joined the Lonesome Pine Fiddlers in June of 1951. Bobby switched from guitar to mandolin, and soon arranged to record four songs with Jimmy under their own names for the King label in Cincinnati. After Jimmy left for Knoxville, Bobby played three weeks with the Stanley Brothers before joining the Marines for combat duty in the Korean conflict. Wounded in Panmunjon, he returned to the front until his discharge in late 1953. By the time Bobby returned to Dayton, his younger brother Sonny had developed into a teenaged banjo prodigy, including a stint touring and recording with Bill Monroe. Bobby appeared as an uncredited guest on Sonny’s later sessions for Gateway in Cincinnati. Jimmy Martin came to southwestern Ohio and joined with Bobby and Sunny as Jimmy Martin and the Osborne Brothers. They started at WPFB in Middletown, then moved to WJR radio in Detroit and CKLW television in nearby Windsor, Ontario. A recording contract with RCA Victor produced “20-20 Vision” and five other scorching bluegrass classics. By early 1956, the brothers were back in Dayton, where they met and formed an act with lead singer/guitarist and fellow Kentuckian Red Allen. A local DJ got them an audition with MGM and “Once More” broke out as a #13 country single. As good as they were — and their playing and harmony singing were truly unique — all bluegrass and classic country artists were facing increasing competition from the youth music preferred by emerging baby boomers. By 1958, Red Allen was gone. Bob’s voice became the center of the act, which was henceforth known as the Osborne Brothers. They kept the banjo, mandolin, and the high lead trio, but increasingly experimented with material and backup instrumentation that could penetrate rockabilly, folk, and modern country markets. 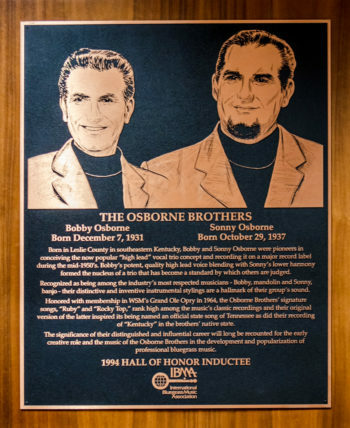 The Wilburn Brothers became the Osborne Brothers’ business mentors, and by 1964 Bobby and Sonny had moved to Nashville, joined the Grand Ole Opry, and signed with Decca (later MCA) records. The career hit “Rocky Top” came in 1968. Written by Felice and Boudleaux Bryant, it was recorded over the objection of the Wilburn Brothers and considered at the time by the Osborne Brothers to be “just another bluegrass song.” Within 10 days it had sold 85,000 copies and it stayed in the Billboard charts for 10 weeks. Twelve more top-100 country hits – five of them penned by the Bryants – followed in as many years. Mass-market radio play, a rarity for bluegrass artists, opened the door to lucrative package tours. But the brothers found that the PA systems of the time failed to project their acoustic instruments. With pickups, electric bass, and eventually drums, they were able to hold their own against the louder acts with whom they shared the stage. After five years playing through pickups, Bob and Sonny removed them in 1974. By 1991, the last vestige of amplification was gone from the group. In other ways, the band returned to the classic approach with which they had begun. As country and folk audiences turned elsewhere, the bluegrass market was increasingly able to offer a sustainable if modest living, through its own festival and performance circuit, record labels, radio programs, and publications. The Osborne Brothers’ career hardly stagnated as the second millennium reached its end. Bluegrass was spreading worldwide, and the Osbornes made several international tours. In 1982, “Rocky Top” was named an official song of Tennessee. In 1992, the Osbornes’ arrangement of “Kentucky” led to a similar honor from the state of their birth. Bobby and Sonny mentored young musicians (notably the Grascals), and produced and recorded with others – including the bluegrass/hip hop fusion GrooveGrass Boyz. Bobby’s duet mandolin performance of “Ashokan Farewell” was on the 2000 IBMA Instrumental Album and Recorded Event of the Year. A half-century musical partnership between the brothers came to an end when Sonny Osborne’s rotator cuff surgery forced him to stop playing the banjo and leave the road. Bobby continued by forming his own band, the Rocky Top X-Press. With son Bobby Osborne, Jr. on guitar, Bobby maintains an extensive schedule of performances, Grand Ole Opry appearances, and recordings on the Rounder label. Bridged the gap between bluegrass and mainstream country music, headlining in both genres. Introduced the high-lead vocal trio with the song “Once More” (1956). Using this arrangement Bobby could sing lead on both verses and choruses, where he was joined by two lower voices. First bluegrass group to play a college campus, Antioch College, Yellow Springs, Ohio, March, 1960. After debuting on WPFB, Middletown, OH (1949), was told not to sing “Ruby, Are You Mad” again, because the staff grew tired of answering telephone requests for it. Bought his F-5 Gibson mandolin from Charlie Bailey of the Bailey Brothers. Bill Monroe once said that there were only three great tenors in country music: himself, Ira Louvin, and Bobby Osborne. Sons Robby, Wynn, and Bobby Osborne, Jr. have also performed as professional bluegrass artists. “Rocky Top,” the Osborne Brothers’ biggest hit, charted higher in re-release (#2 in 1996) than it did in 1968 (#33). Quoted in Barry R. Willis, America’s Music: Bluegrass, 1989. Quoted in Rounder Records promo sheet for the album “Bobby Osborne: Try a Little Kindness,” 2006.